Be the first to hear about their new releases and deals. Download the Booksprout app and search for Kristal Hollis today! Kristal Hollis grew up in a small, Florida town amid cane fields and orange groves. Books fed her imagination, providing adventurous portals to ancient civilizations, medieval fiefdoms, alternate realities and futuristic worlds. Then, a friend gave her Johanna Lindsey's FIRES IN WINTER, a historical romance which ignited a life-long love affair with romantic fiction. 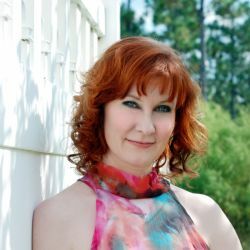 When a family medical situation required her to take a work sabbatical, she began penning small town paranormal romances as an escape from the real-life drama. Even though the crisis passed, her passion for writing continues. A 2015 Golden Heart® finalist, she sold her qualifying manuscript to Harlequin Nocturne. Retitled AWAKENED BY THE WOLF, her first book debuted in June 2016 and launched the Wahyas of Walker's Run series.